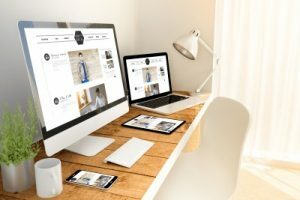 For over 10 years Design & Promote has helped clients get noticed through thorough SEO techniques and as the demands grew, so did the service offerings, including mobile website design in Naperville. Our mobile website design experts can turn your old site into one that is ready to be viewed on mobile devices and tablets. Your site’s visitors will love the intuitive design and functionality of your site and it will help you reach more potential clients. For more information on our mobile website design service in Naperville or if you have any other questions about our digital marketing services, call us at 630-995-7109 today. You can also get in touch with us by filling out the contact form located on this page and we will reply shortly. The main goal of your company’s website is to bring in new leads by informing website visitors in detail what products and services you offer and your products and services can improve something in their lives. If your website is limited due to lack of mobile capabilities, your business is missing out on one of the best opportunities to get noticed. This is because mobile searches have surpassed desktop searches and you want to be prepared to reach every person possible. Having a responsive site also helps you rank higher and search. If your website is not mobile, our expert mobile website designers here at Design & Promote can help. Ultimately, you want your website to make its users happy. If your website is easy to navigate, answers the users’ questions, and can be viewed on a variety of devices, you can see good conversion rates. Your website is essentially your online business card but expanded. If the people viewing it aren’t satisfied, they will look for the next company so having a mobile website can do wonders for bringing in traffic and new leads as well as putting your website in a position to rank higher in search. To learn more about our mobile website design services in Naperville or if you would like more information about our other web solutions, give us a call today at 630-995-7109. Or simply fill out the contact form on this page and we will respond shortly.